After making a trip to Gillette Stadium in 2013, Northbridge is a favorite to make it back to Foxboro in Division 5 this year. The first round of the MIAA football playoffs is in the books, and Central Mass had it's fair share of great games, standout performances and surprises across all four divisions. So, here's a look back at the weekend that was, and a look ahead to the upcoming Central semifinals. It was a rough weekend for the big dogs of D2 Central as favorite St. John's (Shrewsbury) fell to Fitchburg. To be fair to the Pioneers, the Raiders always play them tough, but it was still one of the biggest upsets in the state this year. 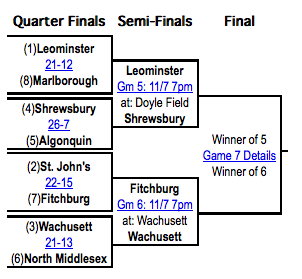 As a reward, Fitchburg will move onto face another team that has beaten St. John's this year, the Wachusett Mountaineers. Expect a physical affair from two hard-hitting teams, with the winner making a surprise trip to the district title game. On the top of the bracket, No. 1-seeded Leominster escaped gritty Marlborough and will face a Shrewsbury team it beat by 30 two weeks ago. Expect things to be closer this time around as the Colonials have re-discovered their offense, led by running back A.J. Laramee. One of the best backs in the region, Laramee also emerged as a receiving threat for quarterback Jack Campanale last week, and it will be interesting to see how the Shrewsbury defense responds to giving up 36 to the Blue Devils in their last meeting. All the higher seeds won in the first round of D4, but the bracket was not devoid of excitement. A furious rally from Doherty helped the Highlanders erase a 19-point deficit against Holy Name, and running back Jahkari Carpenter turned in another night of highlight reel runs for the Inter-High power. Things will only get tougher this week, as Doherty travels to face Worcester-rival St. Peter-Marian. The Highlanders and Guardians played a 20-19 thriller last year, the closest game eventual state-champion Doherty would play in D4, and after a 13-6 slugfest in favor of SPM two weeks back, I'd expect another great game Saturday. 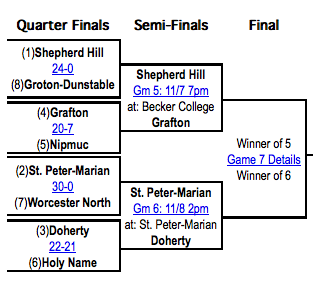 Shepherd Hill remains the favorite after rolling over Groton-Dunstable and should have little trouble with Grafton. Still, the Indians finally put together the complete game many have been waiting for last week, showcasing their potential to be suffocating on defense against Nipmuc. If they can at least slow down the Rams' dominant Double Wing attack, they'll have a shot. We've already covered Northbridge and coach Ken LaChapelle's historic win from last week, and the Rams welcome a very good Tyngsboro team Friday night for a chance to win another big game. 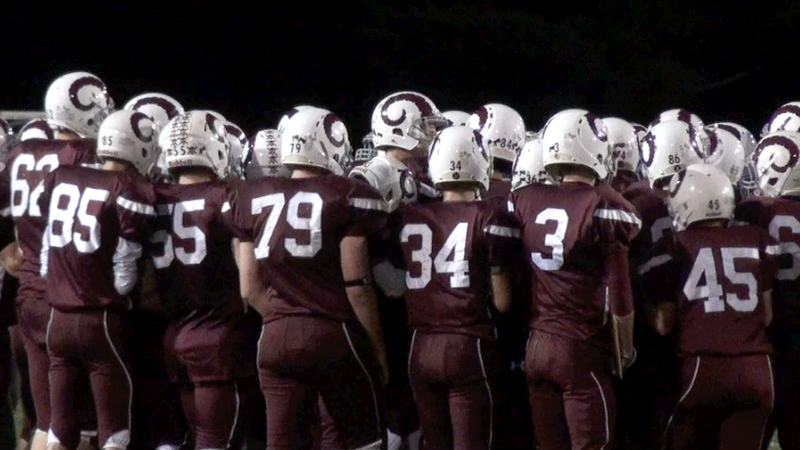 Northbridge led the Tigers by around 30 points for most of their first meeting this year, behind a big day from junior Koby Schofer throwing the ball, and also picking balls off on defense from his safety spot. If the Tigers are to turn the tables, they'll have to eliminate the turnovers and contain Ram running back Jake Wood on outside zone runs and delayed screens. Bartlett beat Uxbridge in a 24-21 thriller two weeks back, and the Indians are coming off a huge win over Auburn last week. It's hard to bet against Bartlett and it's powerful line, not to mention running back Darius Givens, but Uxbridge quarterback Jake Taparausky is rounding into form at exactly the right time. 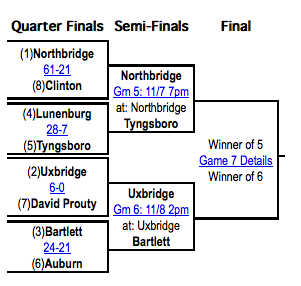 Expect a close one, but if Uxbridge can protect the ball and stack the box against Givens, there's no reason it can't beat Bartlett this time around. It seems like Littleton and BVT have been on a collision course for each other in the D6 Central final since the end of last year, but don't sleep on either of their opponents this week. St. B's can score with anybody, and its explosive offense should have a better showing than its first game against the Tigers. 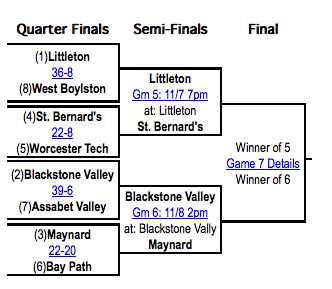 As for BVT, they'll have to deal with a Maynard team that came within two points of shocking Littleton and seems ready to make a push for a district title. The Beavers are playing as well as anybody in Division 6 statewide right now, but Maynard is one of the few teams at this level with the talent to slow down star back Ben Reiffarth, meaning quarterback Andrew Carroll may have to air it out about more this week.